Is frugal innovation revolutionising medtech? APMT explains how its ACOMP system provides real-time monitoring, characterisation and control of polymer properties for medical applications. Automatic Continuous Online Monitoring of Polymerisation Reactions (ACOMP) is a smart manufacturing system that continuously monitors and characterises critical polymer properties during polymerisation reactions and post-processing steps. The advantage of continuously analysing the process in real time allows for faster and more precise control of production. If there is an issue in production and an adjustment is not made in a timely manner, the reaction may produce a polymer batch that is off-spec or unusable. Manufacturers of polymers for medical applications must adhere to stringent regulatory requirements as set forth by the FDA and other regulatory bodies. Due to these regulations, the admissible margin of error for critical polymer properties such as molecular weight, mass distribution and block copolymer composition is much smaller than that of polymers for other applications. ACOMP’s real-time analysis is a valuable tool for manufacturers of polymers because it allows the user to accurately predict and control reaction kinetics and polymer properties. For example, this real-time data enables more rapid adjustments to process temperature or reagent feeds. This capability can virtually eliminate the occurrence of off-spec polymer and increase the efficiency of the process over time. This article explains how ACOMP was used to successfully monitor the polymerisation of polyvinylpyrrolidone (PVP), a versatile polymer commonly used in excipients, contact lens solutions, dispersing agents and other medical applications. Two PVP batch solution polymerisations were monitored with different initiator concentrations of 1.5% and 2.5%. This was done to exemplify how continuous monitoring and analysis by ACOMP can quickly and accurately identify the effect of a small change in initiator concentration on reaction kinetics and product quality as seen by the weight average molecular weight and intrinsic viscosity. In this application, ACOMP uses ultraviolet absorption to monitor the concentration of monomer throughout the polymerisation. A single capillary viscometer was used to measure the intrinsic viscosity, and a 5-angle static light scattering detector was used to measure weight average molecular weight. The ACOMP system interfaced with the reactor through a recirculation loop ensuring a representative sample of the reactor contents was analysed. The reactor recirculation loop was continuously sampled at 0.5 ml/min and diluted to the appropriate detector concentrations using ACOMP’s patented sampling, conditioning and data analysis technology. These fundamental techniques are suitable for other processes including bulk, emulsion and inverse emulsion polymerisations as well as post-processing steps like hydrolysis and quaternisation. As expected, the reaction with 2.5% initiator showed much faster kinetics. ACOMP also tracked the intrinsic viscosity as measured by the viscometer and shows that the higher initiator concentration produced a 10% decrease versus the 1.5% initiator concentration. Figure 1 shows the weight average molecular weight with respect to the polymer concentration for both reactions. As displayed in the figure below, the higher initiator concentration resulted in a 23% decrease in molecular weight. These differences in molecular weight propagation, as seen in Figure 1, resulted in a dispersity in the molecular weight distribution of 1.83 and 1.66 for the polymerisations at 1.5% and 2.5% respectively. This was measured using APMT’s chromatography-free molecular weight distribution analysis. These results are displayed below in Figure 2. In monitoring the polymerisation of PVP by ACOMP, the operator can easily identify and mitigate off-spec product much sooner in the event of an undesirable process condition as seen with a small change in initiator concentration. 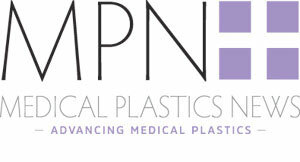 APMT has also used ACOMP in similar capacities to monitor and control polymerisations of other medical polymers including polyurethane, polymethyl methacrylate and polyacrylamide. ACOMP technology is also compatible for online monitoring of radius of gyration, molecular weight distribution, copolymer composition and monomer residual concentration.